At least 180 people have been arrested, some carrying bags of human waste, ahead of a planned protest over the lack of proper sanitation in the South African city of Cape Town. Despite the arrests, some bags of waste were dumped inside some local government offices, local media say. Last week, raw sewage was thrown at opposition leader Helen Zille as she toured poor areas of the city. She is premier of Western Cape - the only province not run by the ANC. The BBC's Mohammed Allie in Cape Town says there is no doubt that housing and sanitation are a real problem in Cape Town but many people are asking why these protests have only taken place in Cape Town, when the same issue exists elsewhere in the country. The African National Congress (ANC) has distanced itself from the manner of these protests. At the moment, many township residents share outside toilets, where conditions are often unhygienic and where some women have been raped at night. The protesters had reportedly travelled by train from townships near Cape Town with bags of human waste before they were detained. Former ANC councillor Andile Lili, who has been expelled from the party over a separate matter, is among those to have been arrested. 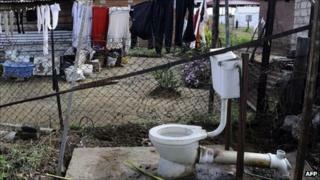 "We are emptying our toilets there because our toilets have smelled for three months," he told South Africa's Eyewitness News. The protesters accuse the local government, run by Ms Zille's Democratic Alliance (DA), of not doing enough to provide proper housing and sanitation to townships. The DA argues that it does not have the money to do this for all of the region's inhabitants. It has provided portable toilets to some residents but the protesters say this is not good enough. It is the contents of these portable toilets which is being used in the protests, which local media have dubbed the "poo wars". Some was also left outside parliament last week. DA official Ivan Meyer said some human waste had been left outside his offices on Monday. "Clearly this is an indication of how low the ANC and the ANCYL [ANC Youth League] is going to fight the election and I'm not worried about it," Mr Meyer said. In 2010, the ANC protested in Cape Town after the DA-run administration built permanent flushing toilets but did not enclose them.